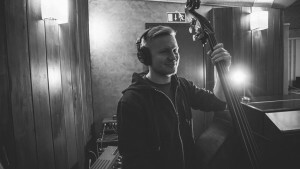 Hailing from Jyväskylä city, bass player Pasi Toivanen has studied music in Jyväskylä Conservatory and in Metropolia Univeristy of Applied Sciences in Helsinki. He has played in the ranks of Jyväskylä Big Band, Aapo Heinonen Quintet and Kadi Quartet in Finland, and also abroad. He values all high-quality music without genre barriors, but plays preferably such with a rhythm.